On January 1st, 2013, Congress passed the American Taxpayer Release Act of 2012 that was signed into law by President Barack Obama on January 2nd. The tax credits covers product purchased and installed January 1, 2012 through December 31, 2013. The tax credit is for 10% up to a maximum of $500 for the combined year periods (2006, 2007, 2009, 2010, 2011, 2012, and 2013) for all improvements combined (for example, if you have already claimed a 25c tax credit of $500 or more, you would not be eligible to make a tax credit claim for 2012). For a radiant barrier or reflective bubble insulation product to qualify, its primary purpose must be to insulate. Must be "placed in service" from January 1, 2012 through December 31, 2013. Must be for taxpayers principal residence. For tax purposes, save your receipt and the Manufacturer's Certification Statement for 2012-2013. RadiantGUARD® radiant barriers & reflective bubble insulations are eligible for this 2012-2013 tax credit. Download a copy of the Manufacturer's Certification Statement for 2012-2013 and SAVE WITH YOUR TAX RECORDS if you plan to obtain the tax credit. You do not need to submit this form to the IRS with your tax form. *Radiant GUARD strongly advises you to talk with your tax professional in determining actual eligibility for tax credits. A federal TAX CREDIT is a full dollar-for-dollar reduction in the amount of federal income taxes an individual owes as opposed to a tax deduction which is only an expense subtracted from one's adjusted gross income that is used to calculate taxes owed based on one's income tax bracket. In other words, a tax credit is an amount taken off the bottom line of taxes you owe. 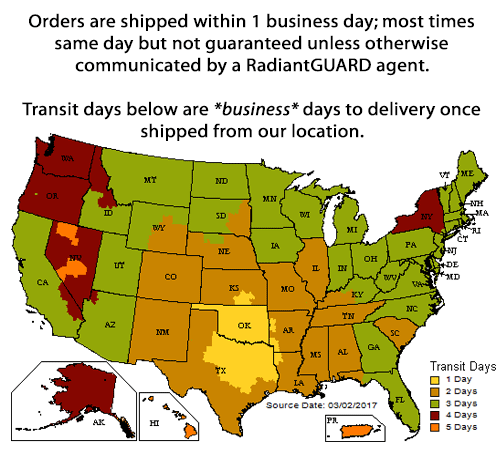 For example, if you bought a RadiantGUARD® radiant barrier or reflective bubble insulation product for a total purchase price of $800, you can claim a tax credit of 10% of that $800 resulting in you paying $80 LESS in federal income taxes.